Teaching Harp for Beginners at John C Campbell Folk School, Scottish Heritage Week. Concert: 7pm, John C Campbell Folk School. Admission Free. Concert: 7pm, Spring Lake Public Library, 1501 3rd Avenue. Free. Concert: 6.30pm, Warren County Library, 2 Shotwell Drive. Free. Concert at St. Mary's Episcopal Church, 85 Conestoga Trail, at 7:30pm. Concert tickets are $15 at the door. General seating. More info: 908-770-1825. House Concert: 6.00pm, Liberty House Concerts. Contact them to reserve a seat. Concert: St Thomas’ Episcopal Church, 5 Hale St.
You Gotta Have Harp house concert at 7:30pm. Tickets $20. Seats must be reserved in advance. Contact Kathy. House Concert: 7pm. Contact details to follow. CCE Washington Area Irish Folk Festival, The Sherwood Center, 3740 Old Lee Highway, from 12-6:30pm. Admission $10. Families $20. Concert at The Chandler Center for the Arts, 71-73 Main Street, at 7:30pm. Tickets $17 in advance, $20 at the door. Concert for St. Andrew’s in the Valley Episcopal Church, Whittier Rd., at 2pm. Suggested donation: $15. Call Valerie at 603-707-0960 for information. Workshops with the artists are being organized by Valerie. Call Valerie at 603-707-0960 for information. Concert for the Stone Church Arts series at the Immanuel Episcopal Church, 20 Church St., at 7:30pm. Most tickets are $20. Call 802-460-0110 for information. Afternoon workshops with the artists, organized by Dominique Dodge, with youth group, 1-3:30pm. Cost is $35. Adult group workshops 3-4pm (Grainne) and 4:15-5:15pm (William). Cost $30. Contact Dominique (email dominiquetheharper(at)hotmail.com) to sign-up. Young Tradition Vermont presents a house concert at 7pm. Tickets are $20. Email Alison or call 802.985.1124 to reserve a seat and get address & directions. .
Workshops at The Arts in the Armory, 191 Highland Ave. Cost $60. Contact Regina Delaney to reserve a seat and to get details at 603-502-7698. Workshop from 6-8pm with the artists. Cost $50. Contact Regina Delaney to reserve a seat and to get details at 603-502-7698. House concert at 7pm. Tickets are $20. Contact Pam at 207-666-3709 to reserve your seats and get address & directions. Concert for Bangor Celtic Crossroads the Bangor Arts Exchange at 7pm. Tickets are $20. House concert at 7:30pm. Tickets are $20. Contact Susan Palmer or call 514-525-3215 to reserve your seat and get address and directions. 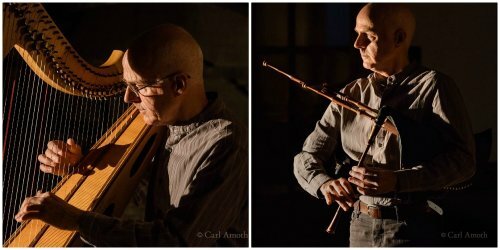 Workshops for the Comhaltas Ceoltoiri Eireann Harp of Tara branch. The Music of Carolan with Grainne at 1pm; Ancient Harp of Scotland with William at 3:30pm. Cost $50 for single workshop or $90/both. Contact Karen at 613-386-5394. 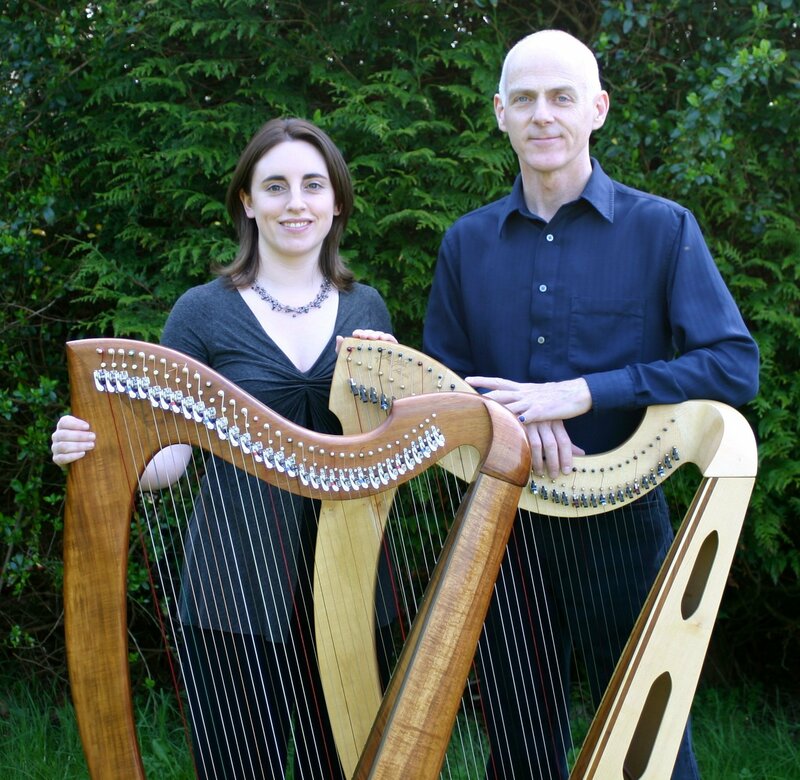 Concert for the CCE Harp of Tara branch at 7:30pm. Tickets are $20 in advance, $25 at the door. Contact Bob at 613-544-1055 to reserve your seat and get the address and directions. Concert at the Nepean Creative Arts Centre in Bells Corners, 35 Stafford Rd, at 7:30pm. Tickets are $22. Workshops with the artists organized by Susan Toman. 10-11:30am with Grainne, 12:30-2pm with William, and 2:30-4pm with Grainne. Topics to be determined. Cost $40 single workshop, or $70/2 workshops $100/3 workshops. Contact Susan to sign-up at 613-825-9950. Concert at St. Paul's United Church, George St. at 2pm. Tickets $20, available at the door. Contact information to follow. 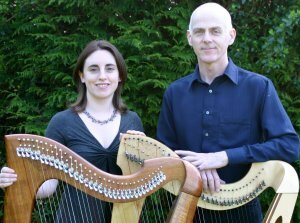 Workshops and concert at the Somerset Folk Harp Festival. William and Grainne will also be leading the Harpers' Escape at Somerset on the Sunday. Register in advance! Concert at 7.30pm at Partridge Hill Farm, 89 Range Road. Tickets $20. Contact Valerie May at vfmay@earthlink.net or 603-707-0960 to reserve tickets. Refreshments at 6:30pm. Workshop at Partridge Hill Farm, 89 Range Road in the morning. Contact Valerie May at vfmay@earthlink.net or 603-707-0960 to reserve a seat. $40/per person. Bring your own harp. Concert: 6.30pm at Warren County Library, 2 Shotwell Drive. Admission Free. Performance at the Gathering in the Gap Festival on the grounds of the Southwest Virginia Museum Historical State Park. Concert at 4pm at the Blowing Rock Art & History Museum, 159 Chestnut St.
Concert at 7pm at the Lincoln Theater, 117 East Main Street. You Gotta Have Harp presents a house concert at 7:30pm. Tickets $15 reserved in advance. Seating is limited so call 856-795-7637 or email Kathy. All-day workshop with Grainne at private home for advanced-level only. Cost is $100 and includes an evening concert with Grainne & William. SOLD OUT. Call Kathy at 856-795-7637 to sign-up & get details. You Gotta Have Harp presents the artists in a limited-seating house concert. Tickets $20 by advance reservation only. Call Kathy at 856-795-7637 to reserve a seat and get location/directions. House concert tickets online are $21. SOLD OUT . Workshop with William Jackson from 1:30-3pm. Cost is $35. Advance registration required. Call Kathy at 856-795-7637 to reserve a seat and get location/directions. Concert at the Monroe Township Library, 4 Municipal Plaza at 2pm. Free. Information: (732) 521-5000. Brick Hill House Concerts presents at 7:30pm. Suggested donation $20. Contact Dinah at (508) 255-3864. Limited seating. House concert. Email Sorrel or call 401-837-7181 to get address & details. Tickets: $15. Limited seating. Concert at DelRossi's Trattoria Restaurant, Rt. 137, at 8pm. Tickets $15. Call Elaina at 603-563-7195 to reserve a seat. Workshops at The Arts in the Armory, 191 Highland Ave. Cost $50. Contact Regina Delaney to reserve a seat and to get details at 603-502-7698. Concert at the Cranford Community Center, 220 Walnut Ave., at 7:30pm. Free. Concert at the Scotch Plains Public Library, 1927 Bartle Avenue, at 7pm. Free. House concert at 7:30pm. Contact Terra Burgoyne to reserve your seat & get directions. Tickets $20. Seating limited. Private concert for residents at Covenant Village of Cromwell at 2pm. Concert at St. Thomas Episcopal Church, 14300 St. Thomas Church Rd. at 4pm. Concert tickets are $15 at the door. Concert at the Burren, 247 Elm St., for the Backroom music series at 7:30pm. Concert at the Monmouth County Library, Eastern Branch in Shrewsbury, 1001 NJ-35, at 2pm. Free. Performing at the annual New Jersey Folk Festival on the Douglass campus at Rutgers University. They'll be on the Skylands stage. All day festival. Rain or shine. Free. Concert at St. Mary's Episcopal Church, 85 Conestoga Trail, at 7pm. Concert tickets are $15 at the door. Workshops in the afternoon. 1:30-3pm with William, 3:30-5pm with Grainne. Cost is $45/per workshop or $80 for both. Contact Debbie to reserve your workshop seat.